We've been planting like crazy getting ready for spring. 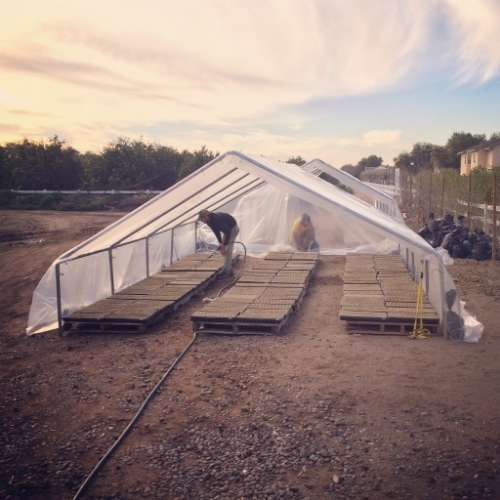 We even had to build some temporary greenhouses to hold the roughly 50,000 seedlings we planted. We started pruning the peach trees in preparation of the upcoming season. We start by removing most of the upper vertical branches and then thinning out the lower branches. This gives maximum airflow and and sunlight to the peaches as they are growing. This last weekend we had the pleasure of giving Chad Robertson a tour of the farm. Chad is the owner of Tartine Bakery and Bar Tartine in San Francisco. The Barnone groundbreaking ceremony took place last Friday. The Barnone project is going to turn our existing quonset hut barn into a community of craftsman. The renovated barn will house serveral new business including restaurants, a brewery and a winery. We will be building a new smaller barn next to the Quonset hut for ourselves. Barnone is set to open in the fall of 2016. Fall/Winter CSA Week 14. Full share: Green Little Gem Lettuce, Brussels Sprouts, Rainbow Chard, Cheddar Cauliflower, Medjool Dates, Minneola Tangelos. Want to join? You can sign up now to reserve your spot for the Spring/Summer Season which starts Feb 20th. Go to www.steadfast-farm.com/csa/ for more info.